SAN JOSE, CA--(Marketwire - November 19, 2008) - RAE Systems Inc. (AMEX: RAE) (NYSE Alternext: RAE), a leading global developer and manufacturer of rapidly deployable, multi-sensor chemical and radiation detection monitors and networks for industrial applications and homeland security, launched a newly redesigned corporate website at www.raesystems.com. "Our products, markets and customer expectations have matured since our last website launch," said Lisa Mork, RAE Systems' director of marketing and business development. "In addition, we have added many new products and application tools to our portfolio. This new website will provide our customers with relevant product, application and market information to keep them better informed about RAE Systems as well as adding to their safety on the job." The company's corporate website was updated to better inform customers in the five key market segments of Oil & Gas, Hazardous Material Management, Industrial Safety, Civil Defense and Environmental toxic gas and radiation monitoring. Products are now organized for easier customer searchability by type of category including Portable Detection, Portable Detection with Wireless, Fixed Detect ion, Area Detection with Wireless and Decision Support Tools. Additional new features of the website include an automatic catalog and product configuration guide. Additional foreign language sites will be available in early 2009. RAE Systems is a leading global provider of rapidly deployable sensor networks that enable customers to identify safety and security threats in real time. Products include disposable gas detection tubes, single gas personal monitors, multi-sensor chemical detection monitors, photoionization (PID) monitors for volatile organic compounds (VOCs), wireless gas detection systems, and radiation monitoring networks for energy production and refining, industrial and environmental safety, and public and government first responder security sectors. RAE Systems' products are used in over 85 countries by many of the world's leading corporations and by many U.S. government agencies. 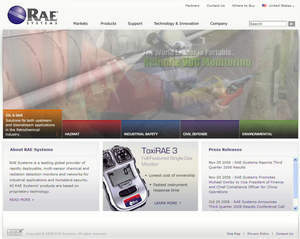 For more information about RAE Systems, please visit www.RAESystems.com.